Tell Congress: Disarm Hate. Act Now. 49 people were killed and over 50 injured during the worst mass shooting in U.S. history at a gay nightclub in Orlando. 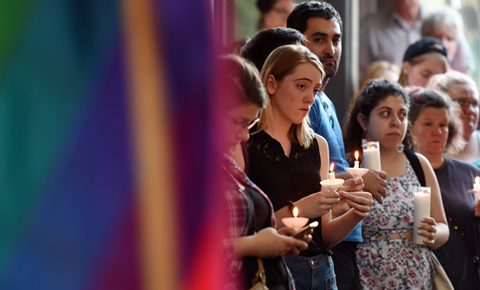 It was an attack on the LGBT community, an act of hate carried out with a gun. Hatred comes in many different forms. But there's no reason why those filled with hate should have a gun. Use this form to sign our petition asking Congress to disarm hatred and keep guns out of dangerous hands. Right now, someone convicted of a violent hate crime can still legally buy a gun. Right now, someone prohibited from buying a gun can still purchase one online or at a gun show, no background check required. Right now, suspected terrorists can still legally buy a gun. But right now, YOU have the ability to close these dangerous loopholes in our gun laws that arm hateful people. We urge you to vote to disarm hatred and keep dangerous people from buying guns. Andrew C. just signed the Tell Congress: Disarm Hate. Act Now. petition. Kerry T. just signed the Tell Congress: Disarm Hate. Act Now. petition. Katie H. just signed the Tell Congress: Disarm Hate. Act Now. petition. Jim L. just signed the Tell Congress: Disarm Hate. Act Now. petition. Patricia W. just signed the Tell Congress: Disarm Hate. Act Now. petition.